#1: Perfect Fitment into any headlight housing - specially designed to closely mimic the size and shape of your original halogen light bulb for maximum capability! #2: Perfect Beam Pattern due to the alignment and design of the low-profile copper PCB and Philips Z ES "CSP" style LED chips. This LED configuration creates a similar light output profile as compared with the original filament bulb for an accurate beam pattern. 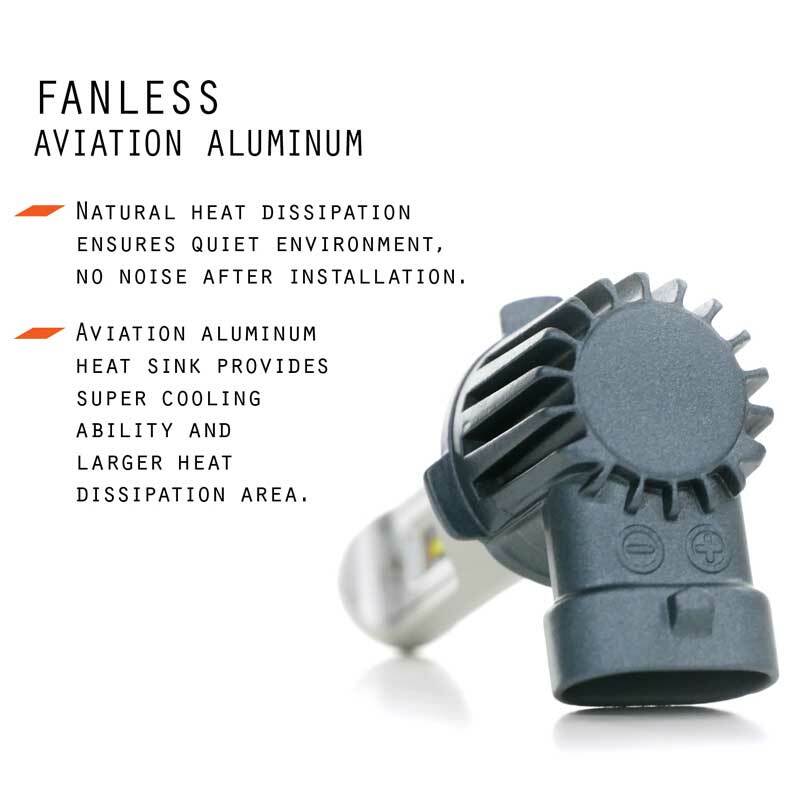 Heat Sink Technology: No Fan Noise! Fans work well to cool down powerful LED headlight bulbs, but the GTR Lighting CSP Mini is unique blend of power and efficiency that does not require active cooling. Coming in at only 16 watts of power, and featuring the Philips Z ES high-efficiency chips, these bulbs create about 2 times as much light as your original halogen bulbs at less 33% less power consumption. In short, they're super efficient so they don't need a huge fan mounted to the heat sink to stay cool! The powder-coated aluminum body of the bulb acts as the heat sink for both the internal driver and the LED bulbs themselves. Thermal Management: The GTR Lighting CSP Mini LED bulbs are equipped with a sophisticated thermal protection circuit to avoid failures due to overheating problems. We've tested these bulbs at 194 degrees Fahrenheit for 15 days straight without failure! The maximum power draw of these bulbs is 16 watts of power and if the LED thermister sensor reaches a temperature of 140 degrees Fahrenheit or hotter the temperature protection kicks in and reduces the light output to a safe level. This smart technology allows the bulbs to never get so hot that they burn out the chips, which is the most common reason for LED bulb failure. 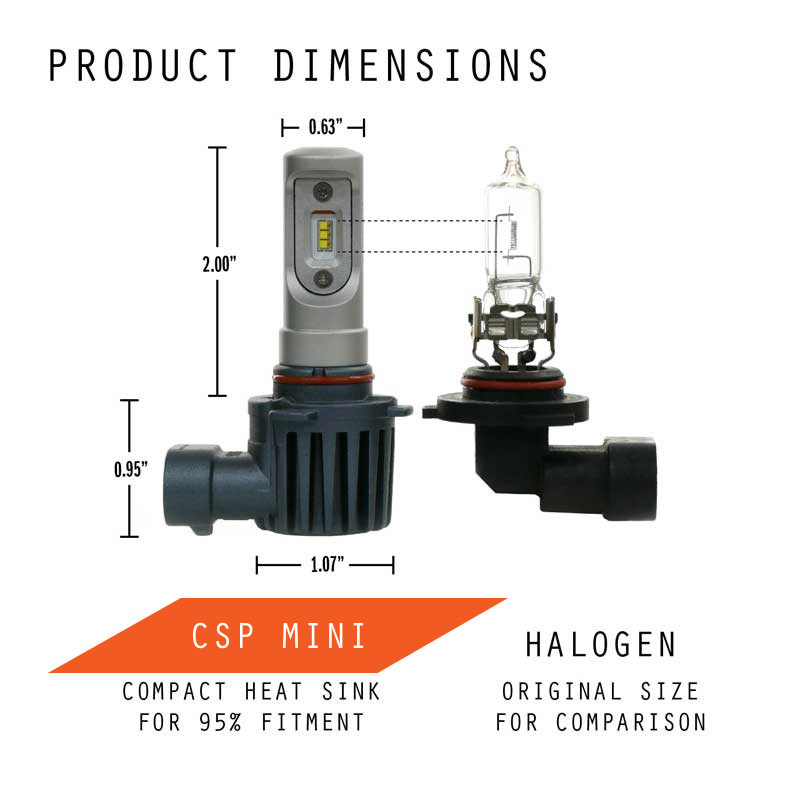 Even at a reduced level of 13 watts of power consumption (to prevent over-heating...), the GTR Lighting CSP Mini LED headlight bulbs will still be noticeably brighter than your old halogen bulbs! This function happens 100% automatically and ensures the longest possible lifespan of your headlight bulbs! Furthermore, the GTR Lighting CSP Mini LED headlight bulbs are equipped with the highest quality possible chip technology. We use the genuine Philips Z ES "CSP" style LED chips that have a higher heat-resistance rating than other similar versions. Beware of imitators! 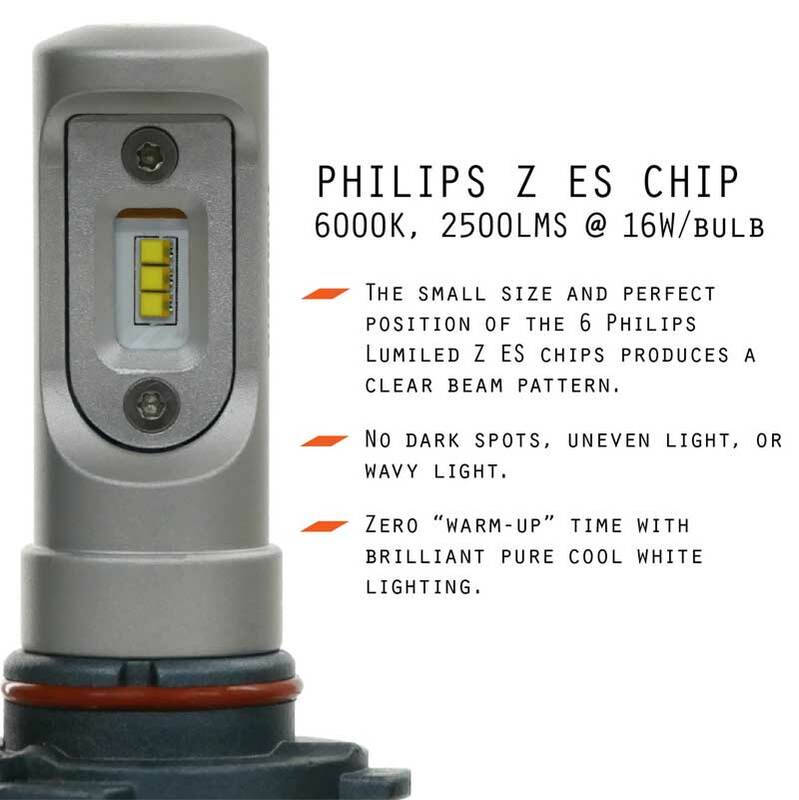 If someone is selling a bulb that looks like ours, make sure they're using the good chips like Philips ZES! These LED chips are rugged, heat-resistant and create the tightest optical source for the best beam pattern. Your headlight bulb LED chips really do make a difference! Brightness: Your original halogen incandescent headlight or fog light bulbs produce roughly 1,000 Lumen per light bulb, at about 55w of power consumption. The GTR Lighting CSP Mini bulbs produce 2,500 Lumen of light at only 16w of power consumption! Not only do these bulbs have the ability to be 2-3 times brighter than your old light bulbs, in most applications they will also mimic the OEM beam pattern to protect other drivers' vision at night! 16 Watts per bulb using 6x Super Bright Philips Z ES "CSP" chips per bulb. LED chips attach to a 1.5mm double-sided copper PCB board - close to the thickness of a filament inside a halogen headlight bulb. 360 degree adjustable beam pattern, these bulbs are designed to be extremely easy to clock for proper orientation in your housing. 1070 Aluminum (135% more heat dissipation over ADC12 Aluminum). Low profile design makes install easy for 95% of vehicles on the road. Integrated Heat Sink Design makes install simple. Weatherproof construction and shock-proof driver. Easy plug and play installation for most applications. Want your headlights to shine brighter and further but your current bulbs just aren't cutting it? Want to get rid of that old yellow tinted light and give your ride an updated look with a cool white light beam? Look no further! Built with high power premium quality Philips Z ES LEDs, these LED headlight bulbs will cast a precise light beam that will give you increased visibility, a wider viewing angle, and a much longer lifetime over conventional halogen bulbs. The bulbs feature great heat management with 1070 aluminum construction, Intelligent Thermal Management, and the newest "CSP" style LED chipset from Philips. Fits all popular headlight and fog light applications. These bulbs are called "LED Headlight Bulbs" but will cross-over to replace your original fog light bulbs as well. Most headlights and fog lights use roughly the same bulbs. Match the bulb number of your original application (example: 9005, 9006, H4, H13, etc...) with the matching GTR Lighting CSP Mini LED headlight bulb and replace bulb for bulb. Fits all applications including projectors, and headlights with dust shield covers. NOTICE: If your vehicle uses a CAN BUS system to operate the headlights and fog lights, you may need additional parts like an LED CANBUS or PWM module. Contact us for details if you are unsure.